Valkyrie Armament Belt-Fed AR (AR-15) 5.56mm NATO/.223 Rem. Automatic Rifle/Carbine/SBR: Stoner 63 Modular Weapons System Revisited. Turn your select-fire/full-auto AR into a true light machine gun (LMG)/squad automatic weapon (SAW). | DefenseReview.com (DR): An online tactical technology and military defense technology magazine with particular focus on the latest and greatest tactical firearms news (tactical gun news), tactical gear news and tactical shooting news. 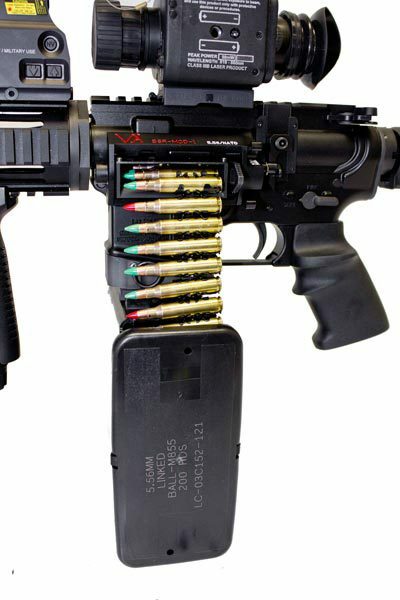 Valkyrie Armament Belt-Fed AR (AR-15) 5.56mm NATO/.223 Rem. Automatic Rifle/Carbine/SBR: Stoner 63 Modular Weapons System Revisited. Turn your select-fire/full-auto AR into a true light machine gun (LMG)/squad automatic weapon (SAW). A company called Valkyrie Armament has just come out with a Shrike-type (ARES Defense Systems Shrike 5.56 LMG/SAW-type) 5.56x45mm NATO (5.56mm NATO)/.223 Rem. belt-fed AR rifle/carbine/SBR (Short Barrel Rifle) that looks pretty good. The Valkyrie Armament Belt-Fed AR is reportedly basically a modernized, “improved” Stoner 63 Weapons System. 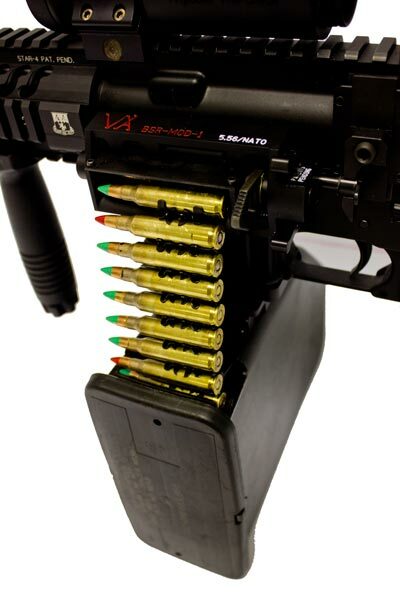 The VA Belt-Fed AR utilizes a M249 SAW ammo box to feed the belted ammo. Making the switch to mag-fed (magazine-fed) operation is quick and easy. Just push out the rear takedown pin, hit the mag release button, pull the belt-feed tray out the top and close the rifle back up by pushing the rear takedown pin back in. Bam. Now you can run mag-fed. DefenseReview (DR) doesn’t know how reliable the the VA Belt-Fed AR is in either its belt-fed or mag-fed configs, yet, since we haven’t run it, nor have we seen any high-round count/adverse conditions testing data on the weapon. That said (or, in this case, written), anyone who’s been reading DefenseReview (DR) for any length of time knows that we really like our belt-fed machine guns up in here, so, just from the pics and video we’ve seen so far, we like this thing. 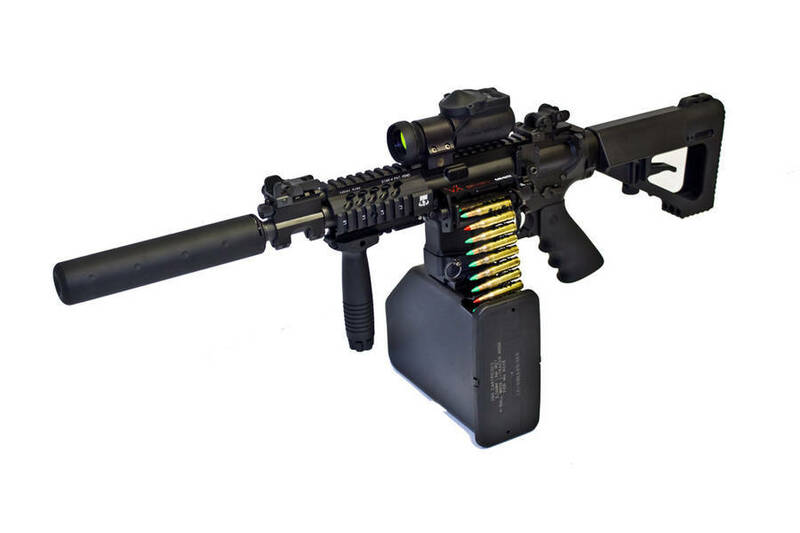 We should perhaps mention that our favorite hard-use (mag-fed) select-fire AR setup designed for sustained full-auto fire, at present, is the FERFRANS Specialties gas piston/op-rod (operating rod)-driven IAR-type (Infantry Automatic Rifle-type) tactical AR carbine/SBR, which utilizes a unique version of the Adams Arms Gas Piston System that incorporates/integrates FERFRANS’ patented Rate Reduction System (RRS) into it. The FERFRANS RRS brings the weapon’s cyclic rate of fire (ROF) under the 700-rpm threshold. This is important, since the FERFRANS weapons operate from the closed-bolt position. However, the FERFRANS RRS isn’t a bad idea for a belt-fed AR, either. In both cases, the reduced cyclic ROF will attenuate/mitigate recoil and muzzle rise, and reduced barrel and weapon heating (including chamber heating). You just don’t need to go over 700 rpm in a 5.56mm NATO/.223 Rem. LMG/SAW or IAR. So, how does the Valkyrie Armament Belt-Fed AR weapons system compare to the Ares Defense Shrike 5.56 with regard to accuracy, reliability, durability, and controllability on full-auto? DR doesn’t know–but maybe somebody out there can do a side-by-side comparison and review for us. If you’re out there, we’re here, and we look forward to hearing from you. We’d also like to see the Belt-Fed AR outfitted with the Ferfrans RRS, and see how the combo does. It should work great (unconfirmed/unverified). In the meantime, please let us know what you think by commenting, below. We look forward to hearing from you, as well. – Weight (No Mag): 6.74 lbs. Valkyrie Armament LLC while new in name is not new to the manufacturing field at valkyrie armament we have machined many different components such as medical devise components, titanium plating anodes for oil and gas power generation for companies, such as bp, Halliburton, ge, and siemens, we make metal forming equipment for the custom car and motorcycle industries they have been seen on numerous television shows and recently in the iron man 1 & 2 movies. Our equipment is also used by the Marine Corps University, the air force, DynCorp International for their Apache helicopter Maintenance Support teams, Los Alamos National Lab, for testing their new polymer compounds, they are also in the Pacific Aviation Museum Pearl Harbor on historic Ford Island for maintenance and restoration on the old war planes just to name a few. – For those that are looking for that tactical, belt fed, 5.56mm weapons platform…Valkryie Armament is your answer. Born from an idea that Life, Liberty, and the Pursuit of Happiness starts with a warm, belt-fed rifle, Valkryie Armament has reinvented the time-tested model of Eugene Stoner’s belt fed conversion into a modern day phoenix. Shoot one…and you’ll want one. – In the shooting sports, there are many options for you to consider when looking to buy a semi-automatic firearm. Rifles, pistols, shotguns…there all out there for you to consider. When looking for a belt fed, weapons platform, however, your options are far more limited. Cost, function, and caliber are three areas of concern that Valkryie Armament considered when improving the Stoner design. There just isn’t a more affordable belt fed, 5.56mm rifle on the market today. Why a belt fed AR15 style rifle? Because you can. – We’ve all heard it before…why do you own an “assault rifle”…why do you need a “scary, black rifle”…why, why, why? Simply put, because you can. In this great land of ours, the liberties that we all enjoy were born in the barrels and breeches of our forefather’s flintlocks. This truth is undeniable; however, it is continually under siege from the violent storm of opposition. Valkyrie Armament is your conduit to politely tell those that ask you why…to go pound sand. Video: Armatac SAW-MAG (also written SAWMAG) 150-Shot Double-Drum Magazine for USMC’s HK M27 IAR (Infantry Automatic Rifle) for Mobile Infantry: FN M249 SAW/LMG Look Out! Shrike 5.56 by ARES Defense Systems Finally Makes it to Production. 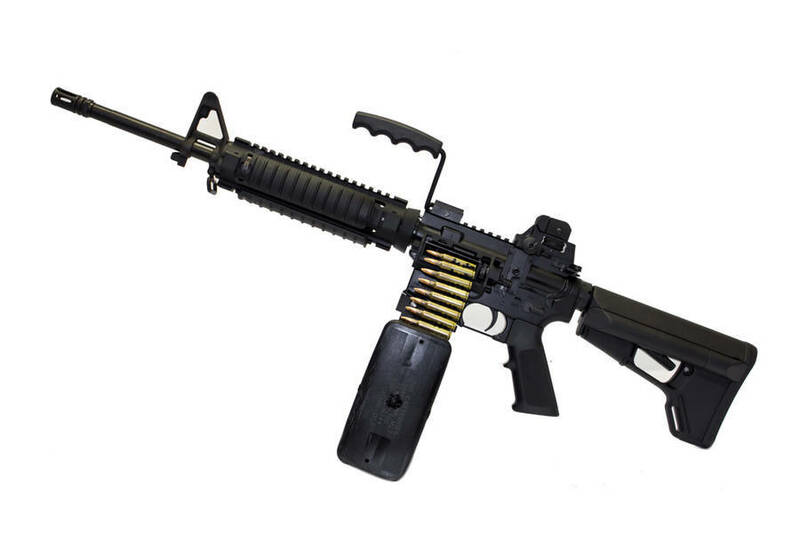 Want to Turn Your AR-15 into a belt-fed? It’s Shrike Time. Previous: FN HAMR (Heat Adaptive Modular Rifle) Introduced at AUSA 2010: FN SCAR Meets IAR (Infantry Automatic Rifle). FN MK16 SCAR-L goes open-bolt for sustained full-auto fire capability.